Results: 1 to 10 of a total of 2333 results. 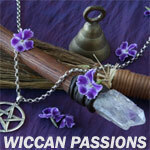 Looking to get back to my Wicca roots after being away for to long, and meet Wiccans in my local community. Looking to meet people to enhance my spiritual life. I have reached a place in my life that I want more, more knowledge more experiences. Sort of looking for a fellow friend or companion to walk with and guide at times through this spiritual journey of life and all it's wonders. Does gapguy74 belong in this group?